Pinterest is on the cutting edge of visual recognition technology which matches images with other similar images accurately enough to show related items next to images that have no text at all. Coming soon is a feature that will allow Pinterest users to take a photo of an object like a purse and instantly compare that real world object with other similar ones. 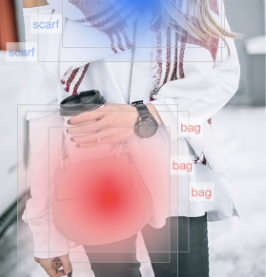 Today, Pinterest introduced Automatic Object Detection for its most popular categories, allowing visual based searches for products in a Pin’s image. The goal is to use automatic object detection in order to make visual search a seamless experience on Pinterest. Detecting objects in visual search allows Pinterest to do object-to-object matching. Then, if you see a chair you like at a store or someones house you or you find that perfect chair on Pinterest you will be able to view it in various decorative home settings. Our first challenge in building automatic object detection was collecting labeled bounding boxes for regions of interest in images as our training data. Since launch, we’ve processed nearly 1 billion image crops (visual searches). By aggregating this activity across the millions of images with the highest engagement, we learn which objects Pinners are interested in. We aggregate annotations of visually similar results to each crop and assign a weak label across hundreds of object categories. An example of how this looks is shown in the heatmap visualization below, where two clusters of user crops are formed, one around the “scarf” annotation, and another around the “bag” annotation. Read more on this at the Pinterest Engineering Blog.